Yeeeeeeeeehaaaaaaaaaaw! 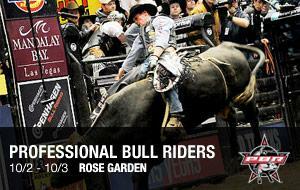 Professional Bull Riding is coming to The Rose Garden this weekend (Friday Oct. 2nd & Saturday Oct 3rd) for an adrenalin packed roller coaster of action. This is a major stop for the Professional Bull Riders (PBR) whose 40 city stop is building to a huge PBR Built Ford Tough World Finals in Las Vegas where a $1,000,000 bonus will be awarded to the 2009 PBR World Champion. The Portland stop will feature a star-studded line-up of athletes including reigning Portland champ and 2008 PBR World Champion Guilherme Marchi (Leme, SP, Brazil); hometown bull rider and fan favorite Ross Coleman (Molalla, Ore.); Oregon cowboys Cody Campbell (Summerville, Ore.) and Cody Ford (Stanfield, Ore.) and more! On Portland is giving away a pair of tickets to the Friday Oct 2nd PBR event. All you need to do to enter is post your favorite cowboy/bull riding saying in this posts comments and we’ll pick a winner on Noon Oct 1st. Congrats to Chris Snethen winner of this giveaway! Never kick a cow patty on a hot day.